My daughter has a friend over and all three of them had been playing happily for the past 2 hours. The kind of nice play between siblings that you know has a limited shelf life. They draped our stairs it with all the blankets in the house and constructed a crash pad of pillows at the bottom. Honestly, it looked the like the most painful slide in the world, but they were having fun. Make them do an activity together? Have them hug it out? Nope. I’m not engaging in any of that. I love my sister, but I think we would murder each other if forced to wear a buddy shirt when we’re angry. Plus, what does this practice teach our kids? When someone makes you mad, you should ignore the problem and act nice? 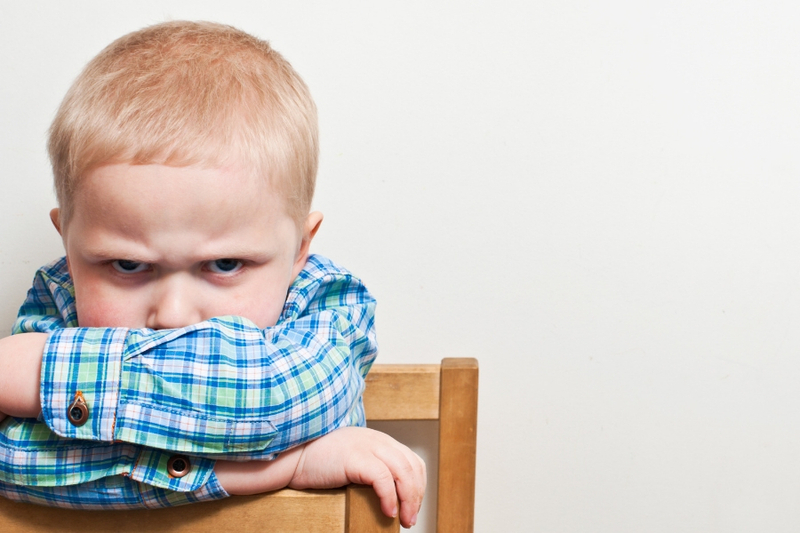 Conflict is a normal and natural thing the kids must learn to work through. But we need to let them solve their conflict on their own. But how can we manage sibling fighting? We have to do our best to ignore it. And that can be extremely hard. When my daughter walked into my office to complain about her brother, my first instinct was to grill her on what happened. I wanted to get both sides of the story and then make my decision accordingly. And then I asked them to leave my office. My kids are never happy when I refuse to step into their arguments. “ARRR.. I’m so mad at you!! !” he’ll scream. “Don’t scream at me” as she follows him down the hallway. I’ll ignore them. They’ll yell a few more minutes until deciding they both need time alone. 30 minutes later, as long as I stay out of it, they’ll pretend nothing happened. Where I’ll draw the line.. However, sometimes the fight doesn’t stop at yelling. Lately, my five-year-old son will raise his hand to hit his sister. She’ll grab his wrists to stop him and that’s where I’ll find them: Locked in this wizard fight where each is using their individual powers to stop the advances of the other. As soon as it becomes physical, I’ll step in. Every time he hits or throws something, I immediately stop the fight. I take him into another room, away from his sister, and we talk. At that point, it becomes less about the subject of the argument and more about finding a more acceptable way to manage his anger. We have a rule: We never hurt people or things when we’re angry. We talk about other ways to express his anger. Right now, screaming into a pillow is on the top of his list. As a teacher, I noticed that the more I got involved in my student’ arguments, the less happy they would be. I remember one year, this group of three girls had one conflict after another. Every other day, they would summon me out to the hall to explain their latest conflict ask me to mediate. However, they never learned how to handle these problems themselves, because I didn’t give them the chance. People build confidence in their own abilities the more they are allowed to struggle in uncertainty and solve their own issues. I’m not endorsing a Lord of the Flies type society here, far from it. But as long as kids know the rules of fighting fair and solving their disagreements in a productive way, it’s OK to let them fight it out. Do your kids know how to fight? Name calling. Blaming. Saying hateful things. These are things that can never be taken back. If kids fight like this, fighting will do more harm than good. Instead, teach them to fight fair. 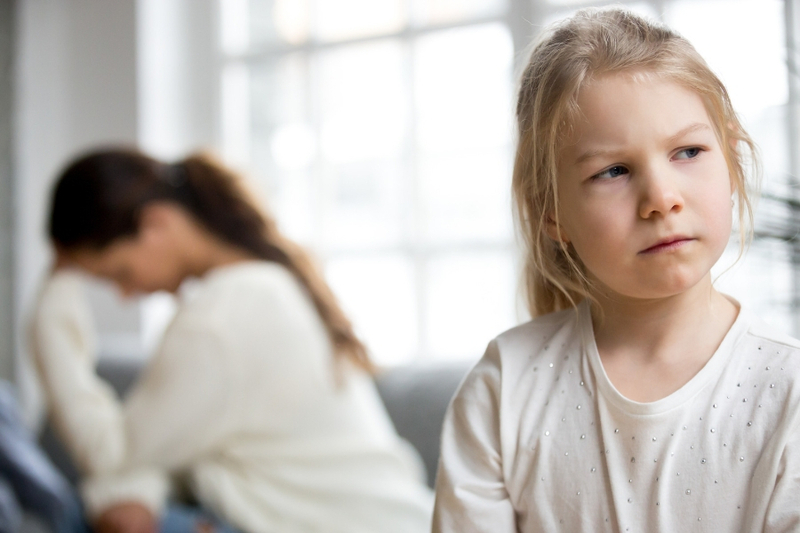 My kids know that every time they have a disagreement with one another, one of the first things they should do is tell the other how they feel. Because emotions are super high at this point, they rely on one key phrase. I feel _______ when you ______ and I would like you to ________. If they scream this at each other, fine. Or they agree to seperate and do other activities (yep, usually the outcome). I’ve made a quick cheat sheet for you on how to teach an this phrase called an “I” statement, step-by-step. I break down the exact steps I used with my own kids as well as with my students. Print your free cheat sheet on teaching kids how to fight fair. Download your free cheat sheet . You’ll get my step-by-step strategy on how to teach kids to fight fair and subscribe to the No Guilt Mom community where I’ll send you tons of goodies along with my weekly newsletter. Hang on your fridge. Someplace you can see it and remember to use it. If your kids can read, it’s a great reminder for them as well. Here’s a sneak peak of what you’ll get. 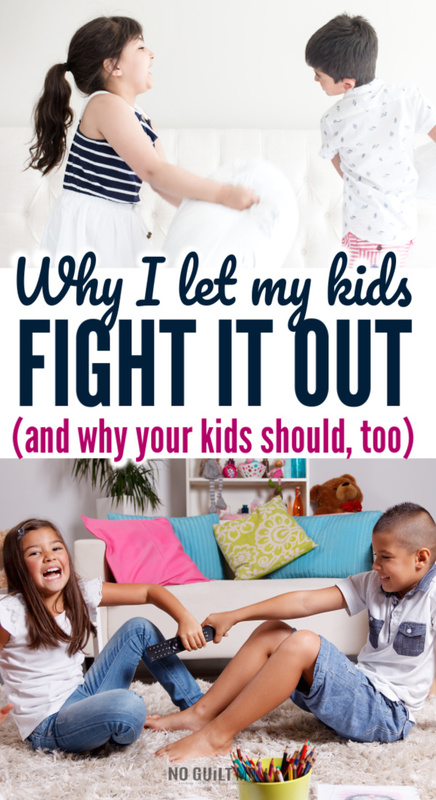 Will you let your kids fight? Managing sibling fighting can be incredibly stressful. However, you don’t need to get involved in every argument.